Editor's Note: State-by-state data follow in the table below. Earning a college degree remains one of the most important investments one can make in his or her future. Over the course of a lifetime, the average American with a bachelor's degree will earn approximately $1 million more than those without any postsecondary education, are more likely to repay their loans successfully, and is also far less likely to face unemployment. Ensuring all Americans have the opportunity to gain the knowledge and skills needed to succeed in the global economy is critical to our nation's economic competitiveness and success; by 2020, an estimated two-thirds of job openings will require postsecondary education or training. That's why the Obama Administration has made historic investments to ensure college opportunity, affordability, and success, doubling investments in Pell Grants; creating the American Opportunity Tax Credit worth $10,000 over four years of college; making student loans more affordable by cutting interest rates and allowing borrowers to cap student loan payments at 10 percent of income through the Pay As You Earn and other income-driven repayment plans; making access to financial aid and college information simpler and faster; and promoting innovation and competition to bring down costs and improve college quality. The results show: more students are graduating college than ever, and new student loan defaults, delinquencies, and forbearances are on the decline. Despite this progress, many American families still feel college is out of reach, and persistent gaps exist in college attendance and completion. While half of all people from high-income families will earn a bachelor's degree by age 24, just one in 10 people from low-income families will. In addition, today's college students face new and different challenges. Nearly nine of 10 undergraduates live off-campus—either with parents, children, or roommates, or on their own. About seven in 10 community college students work while they're in college; nearly a third work full-time. And one in four undergraduates are parents; more than 10 percent of undergraduates are single parents. Too many students face barriers to completing college due to lack of access to basic resources like housing, food, health care, and childcare. Students who complete their degrees experience better long-run outcomes. College graduates are more likely to be employed, have good-paying jobs, and pay back their student loans on time and successfully. But increasing college costs deter some would-be students from pursuing a college education. Between 1992 and 2012, the average amount owed by a typical student loan borrower who graduated with a bachelor's degree more than doubled to a total of nearly $27,000. Two out of five first-time, full-time students who enroll in a bachelor's degree program don't graduate within six years. The median debt of borrowers who defaulted by the end of June 2016 is less than $11,300, barely half of the median debt load for all students$19,724. The average debt for students who default is $21,100, half the average debt of those who graduate$44,400. Students who take out college loans but don't graduate are three times more likely to default than borrowers who complete. During a speech today at the 129th annual meeting of the Association of Public and Land Grant Universities, U.S. Secretary of Education John B. King Jr. discussed the Obama Administration's commitment to expanding access and ensuring successful outcomes among students pursuing a higher education; the urgent need for colleges and universities to serve an increasingly diverse and non-traditional student body; and accelerated efforts across the federal government to support our most vulnerable students complete their studies and thrive in the economy. Treasury is updating stakeholders including institutions of higher education on opportunities to improve postsecondary students' financial literacy and well-being, including efforts to help eligible families claim the American Opportunity Tax Credit and Lifetime Learning Credit. One study shows that coordinating available public federal benefits for students can help close the gap on unmet financial need, support students' college completion, and lead to success in the workforce. Putting this into action, community colleges across seven states joined the Benefits Access for College Completion to help eligible students access resources—such as SNAP, TANF, and child care—more easily. Colleges each developed strategies that were relevant to their own students' and community's needs, through activities that included improving referrals based on financial need, strengthening existing centers like Single Stop, and integrating registration and support as part of regular financial aid, academic, and career advising practices. America's College Promise (ACP), which would make two years of community college free for responsible students, letting millions of responsible students earn the first half of a bachelor's degree and the skills needed to succeed in the workforce at no cost. At least 37 programs have launched free community college programs since January 2015, adding more than $150 million in new investments in community colleges to serve 180,000 students. If all states participated, ACP could serve 9 million students and increase state investment in higher education, particularly based on student success rather than enrollment alone. Predominant four-year degree: Most common degree awarded by institution. See College Scorecard documentation for details. * Decrease in average graduation rate in Arizona due to reporting changes for University of Phoenix from 2012 to 2013. See Orozco, Viany, and Nancy K. Cauthen. 2009. Work Less, Study More, & Succeed: How Financial Supports Can Improve Postsecondary Success. New York, NY: Dēmos. http://www.demos.org/sites/default/files/publications/WorkLessStudyMore_Demos.pdf. Gault, Barbara, Lindsey Reichlin, Elizabeth Reynolds, and Meghan Froehner. 2014. "4.8 Million College Students are Raising Children." Washington, D.C: Institute for Women's Policy Research. http://www.iwpr.org/publications/pubs/4.8-million-college-students-are-raising-children. The statistic that borrowers who withdraw from school are 3 times more likely to default than borrowers who graduate is based on internal modeling from the Office of Federal Student Aid. 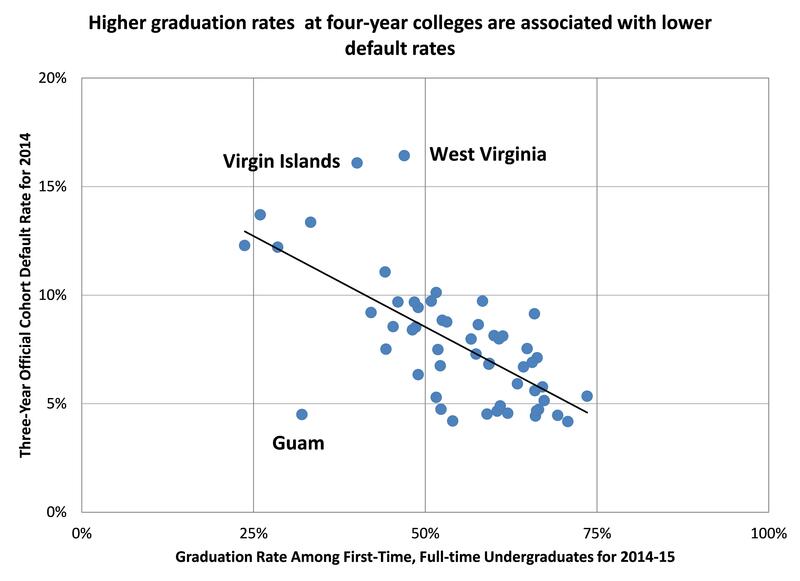 This finding is consistent with numerous other multi-variate statistical analysis of student loan defaulters over the past 20 years, including: Gross, Jacob P. K., Osman Cekic, Don Hossler, and Nick Hillman, "What Matters in Student Loan Default: A Review of the Research Literature", Journal of Student Financial Aid, Volume 39, Number 1, 2009, http://files.eric.ed.gov/fulltext/EJ905712.pdf; "Student Loan Default: Some Relevant Factors", Iowa College Student Aid Commission. April, 2010, https://apps.iowacollegeaid.gov/marketing/docs/2010studentloandefault.pdf; and Steiner, Matt and Natalie Tezler, "Multivariate Analysis of Student Loan Defaulters at Texas A&M University", TD Research and Analytical Services, 2005, http://www.tgslc.org/pdf/TAMU_Multivariate_Analysis.pdf. Price, Derek, Meg Long, Sarah Singer Quast, Jennifer McMaken, and Georgia Kioukis. November 2014. "Public Benefits and Community Colleges: Lessons from the Benefits Access for College Completion Evaluation." DVP-Praxis and OMG Center for Collaborative Learning. http://www.equalmeasure.org/wp-content/uploads/2014/12/BACC-Final-Report-FINAL-111914.pdf.